In this article we'll describe how you can edit (modify) existing styles to suit your specific reporting needs or to make sure they're aligned with your branding. Please note that you can also add your own (completely new) style. In fact, you can create as many as you please. In this way you can, for example, define your own corporate reporting standards or simply create a separate style with specific color and other design definitions that you need for a specific purpose. 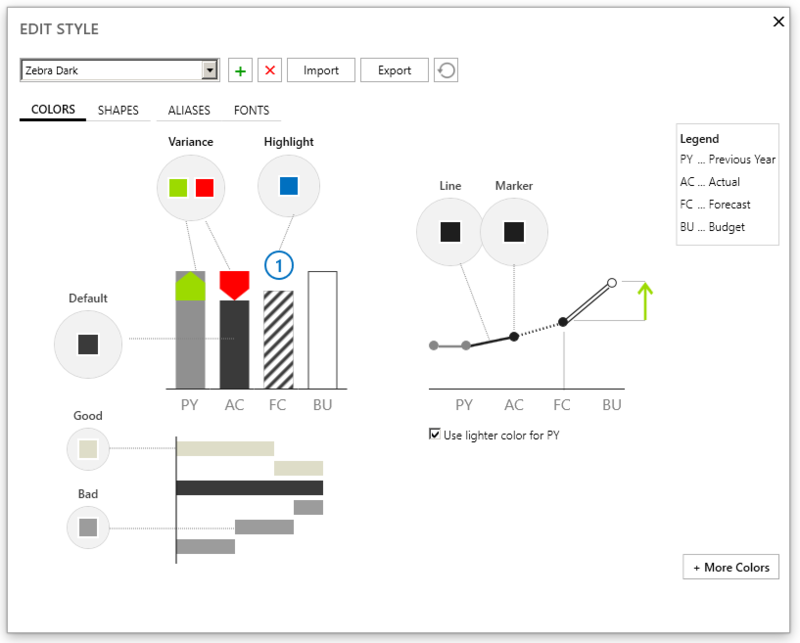 The styles can be distributed between several users to ensure that every report designer in an organization produces a consistently designed, standardized report. 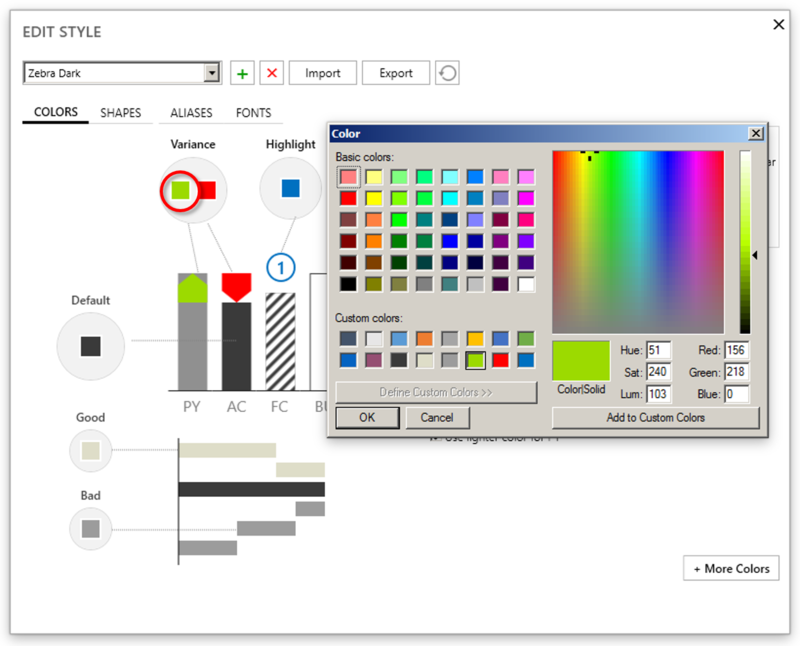 For importing or exporting styles, click on the Import or Export button, respectively. The name of the style you'll be editing is displayed in the drop down menu at the top of the window. Make sure this is the right one, otherwise select another style from the drop down menu. Here you specify the default color scheme within the selected notation. 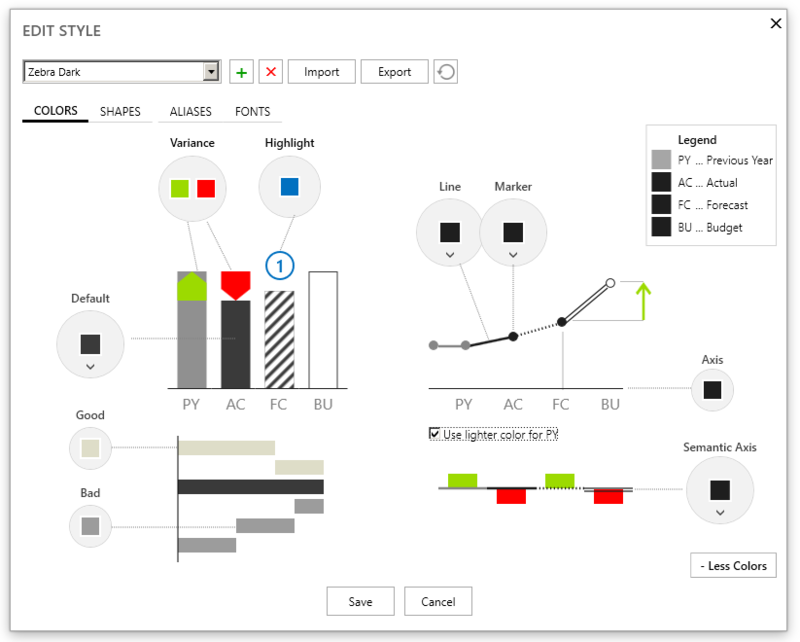 You can customize the default (neutral) chart color, the color for "good" and "bad" KPIs (e.g in waterfall charts), variances, highlights, lines and markers. 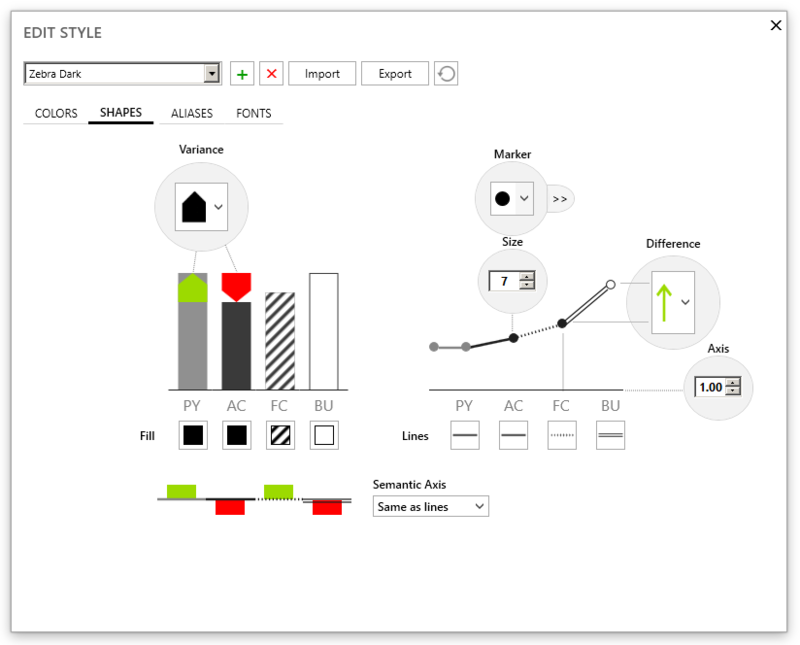 Additionally, you can set Line, Marker, Default and Semantic Axis to use Scenario colors instead of specified colors. Click on the small down arrows (∨) to change these settings. You can change the shape of any element by simply clicking directly on it. Aliases are labels that represent a particular business scenario in your source data. By default, Zebra BI will understand standard data labels, such as PY, AC, FC, BU, PL, etc. However, you can you change or add aliases. For example, you can add scenario labels for your local language or change existing labels to match the ones that you're already using in your data sources. You can add as many aliases as you need, there is no restriction. So for example you can assign multiple aliases for the forecast scenario label, like: FC, FC1, FC2, FC3, …, LF, LF1, LF2, etc. 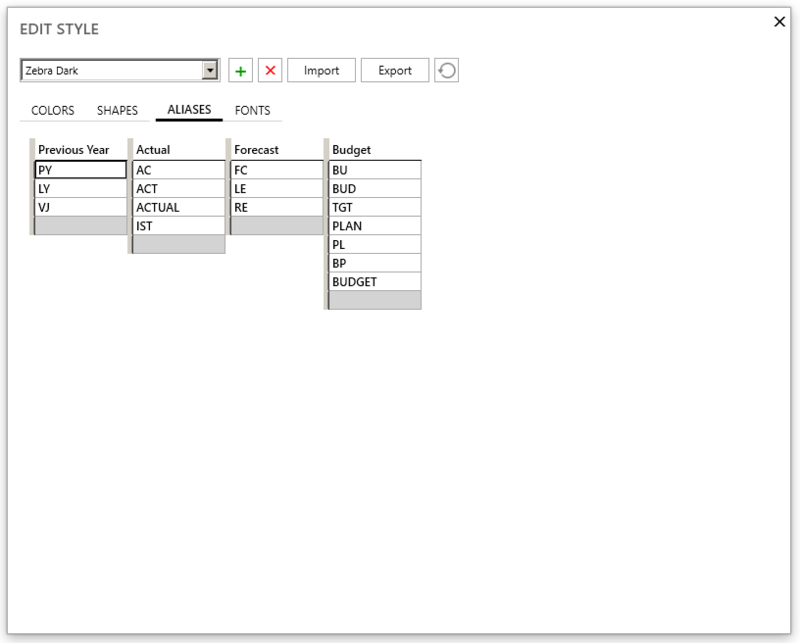 To add a new alias to a business scenario, simply write it in the last (empty) row and press Enter on your keyboard. To delete an alias, click on it and press Delete on your keyboard. 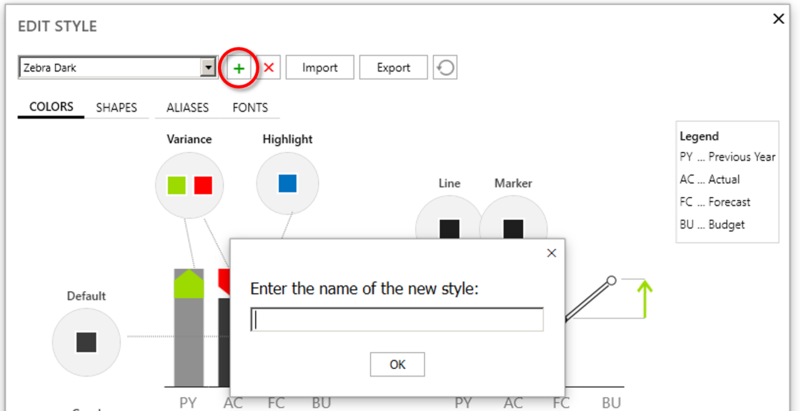 NOTE: If you're using more than just 1 style in your reports and you have defined your custom labels for scenarios, make sure you change aliases in all the styles you'll be using. 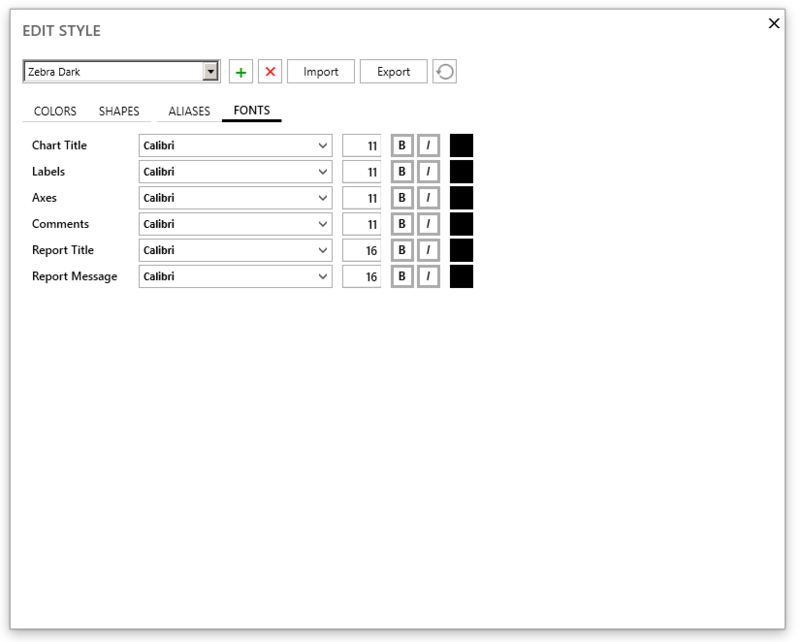 The fourth tab lets you specify your desired fonts, font sizes and colors for all different kinds of labels.